So we’ve all seen the new Skyward Sword trailer. It was probably the most interesting one yet. Unlike previous ones, it was done theatrical-style and showed us more story than it did gameplay. I wrote an article analyzing the last Skyward Sword trailer, and I received requests to do more, so I thought I’d have a go at this one as well. The new trailer gives us a lot of insight into what the story of Skyward Sword will be. It confirms Zelda, the Skull Kid, and even Tingle as characters who will be in the game. We are also finally given a full view of Skyloft, and even an explanation of who the dear friend Link is searching for is. The opening panorama is obviously Skyloft. The floating landmass amongst the clouds is just like many have imagined it, but I was surprised by the village near the edge. The buildings look very primitive and simple, unlike what we see in the City in the Sky in Twilight Princess. I’ve always reminded myself of the possibility that they’d deny us this connection, and this doesn’t look good so far. I still find the theory quite probable given other evidence, and perhaps this evident lack of coordination of the cultures may only add an interesting twist to the story of the Oocca. The next important shot shows us Zelda! She looks similar to the Zelda in Twilight Princess, just in Skyward Sword’s artstyle. The major difference to her appearance is that she does not look quite so serious. The way she’s conveyed in this trailer gives me the feeling that she hasn’t experienced the responsibility of being princess yet. She is dressed like all the other Skyloftian women, but she also wears the ceremony garb, minus the freaky mask. She stands among the priests – or whatever they are – leading the ceremony, so she seems to be an important person in this village. Standing all around her and the priests are men who wear what is basically identical to Link’s outfit. Green tunic, chainmail underneath, gloves, and a sword and shield. The swords they wield aren’t visible, but appear to be generic. Their shields however appear to be the same as the one Link had in the previous Skyward Sword trailers, and are identical to the Hylian Shield from earlier games. It seems that the Hero’s Clothes originate from Skyloftian warriors. And then, beside Zelda, we see Link himself. He dresses in the same green clothes as the other warriors, but it’s definitely him. He’s solemnly staring ahead until Zelda turns to him and smiles, at which point he smiles back. Link seems to have his attention specifically on her, so he is probably her personal bodyguard. They also are clearly good friends. Interestingly, all of these Skyloftians are gathered around a statue made entirely out of jewels. It is a statue of three women, each one made out of a different color of jewel (red, blue, and green), and they rest on a pyramid-shaped yellow jewel. So from this we know that the people of Skyloft worship the Goddesses and probably have the same standard religion as the Hylians did in the rest of the series. This plus the presence of Zelda and the Hylian Shield is strong evidence for the theory that Skyward Sword will show the creation of the Royal Family of Hyrule that we see in the rest of the series. The black clouds that suddenly interrupt the ceremony look exactly like what was emanating from the top of the golden boss in the GDC trailer. Of the four figures you can faintly see through the smoke as the Skyloftians scurry away in fear, I would draw your attention to the one farthest to the right. Judging from the outline, specifically the shape of its cloak, I’d say that this is probably the character we saw in the GDC trailer. 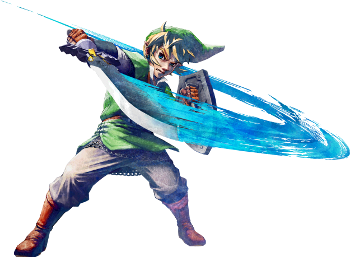 Link, the only guard not scared off by the dark cloud, completely fails in defending Zelda from the red-cloaked villain that steps forward out of the cloud and stops Link’s attack short by breaking his cheap-looking sword with his bare hands. 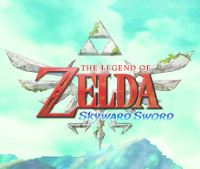 This is important because it leads to Link getting the Skyward Sword later in the trailer to replace his broken one. We see this character pretty closely as it pans across his body. This man has the same hair and skin color as the character from the GDC trailer, only his hairstyle is much simpler and shorter, and his build much bulkier, so he appears as a physically stronger, more masculine character of the same race. He wears leather clothing underneath, it seems, but what is mostly visible is his gold-plated armor. I’m very happy with this next connection; it’s not quite as obvious as the Gilded Sword, but it is quite unmistakable. Focus on just the front of his armor: one large gold chest plate with more gold plates beneath that. The red jewel on his chest especially provides undeniable evidence that just like GDC’s character resembled the Gilded Sword, this character resembles the Golden Gauntlets from Ocarina of Time. After the red-cloaked spade character grabs Zelda, the four of them plus Zelda disappear just like the yellow-cloaked diamond character did at the end of the GDC trailer. The particles they leave behind vary slightly to match each character’s ‘theme,’ but they still remind one of the Twili method of transportation. So the interlopers have kidnapped Zelda, some important character tied to a land in the sky whose inhabitants revere the Triforce as a sacred object. Why? The obvious answer that comes to my mind is that they (or their boss) wish to interrogate her and learn the whereabouts of this object that they’re seeking. Of course, this is going back to the story we heard in Twilight Princess, not the trailer itself, so if it turns out that they aren’t connected like that, the motive of these villains could be entirely different. And now we get to the huge airship. 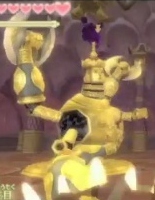 My analysis: The main villain of Skyward Sword is Bowser. Well… I don’t see any Bullet Bills or Bob-Ombs, so probably not. Actually, this airship bears more resemblance to the City in the Sky, despite the latter evidently incorporating a floating landmass much like Skyloft. It’s supported in the air by several large propellers like the ones in Twilight Princess, also reminding me of the collector’s ship in the second Pokémon movie although it’s of an entirely different shape and composition. If Skyloft turns out to not be the City in the Sky, then perhaps the city was constructed using the same technology as this airship. I wish I could get a closer look at one of those doors on the main deck to compare some symbols. Either way, with this in addition to the mechanical dungeon shown in the GDC trailer, there does seem to be an uncharacteristically large focus on technology in this game despite its place on the timeline. Link is shown running toward the airship, which leads me to believe that this is where Zelda was taken. However, before he leaps off what looks just like the precipice from the first Skyward Sword trailer, he is stopped by yet another new character. We actually don’t see much of him, as the shot is from partially overhead. His face is obscured by the blue hood of his cloak, but we see he has bandaged arms and his face is actually obscured behind more bandages. This blue-clad character gives Link the sword from the GDC trailer, which must be the Skyward Sword as it leads him to the land below. You may have already drawn some conclusions about this character based on the bandages and blue color scheme. I think those conclusions are very sound if you consider the tip of gold that can be seen on this character’s back. It’s a small detail that I didn’t notice until someone on the article staff pointed it out to me, but I think it could belong to a harp identical to the one we saw in the GDC trailer, which I have previously compared to Sheik’s harp. 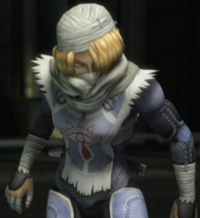 Because of this, I am now certain this character is Sheik. This is pretty strange, because Zelda is Sheik in Ocarina of Time. But what if Zelda only disguised herself as someone who was real? Some kind of hero? This character’s cloak is of a similar style to those of the four kidnappers, but he seems to be helping Link. This supports the theory about the Sheikah being in Skyward Sword, and it seems that the game takes place before the Sheikah served the Royal Family (or before the Royal Family even existed). In my analysis of the GDC trailer, I reported what I thought was the Skull Kid, but a closer look at a higher-quality video revealed that it was just a skulltula. This time though, there’s no doubt that this character is Skull Kid. It’s not just a distant silhouette. It’s the real thing. It looks like Link’s still in Skyloft in this short scene (not sure why he would be at this point since he has the Skyward Sword – but they don’t tell us everything! ), so his presence makes even more sense than how I explained it last time. He “returned to the heavens,” and it seems that he continues causing mischief, stealing Link’s sword. This is what the developers were talking about when they mentions portion of the game when Link is swordless. During the swordless gameplay shots, which certainly occur shortly after his encounter with Sheik judging by the lack of the Skyward Sword spirit icon on the D-pad, Link has six hearts. A first for the Zelda series, it appears that you start with double the normal amount of hearts in Skyward Sword. I’m a little worried about how easy it will be with so much, but they were probably trying to make it easier for people who had never played a Zelda game before to get the hang of it. I assume there will still be a maximum of 20 hearts and a pretty high amount of heart pieces, so I think each heart container will require five or six heart pieces to fill. In the midst of this gameplay, I was granted a very pleasant scene. TINGLE!!! His green uniform almost looks like a simplified version of the Skyloftian guards’ uniform. It looks like he wishes he could have that job. They probably won’t let him because he’s too short. Since his clothes more closely resemble the classic Tingle uniform than those worn by Purlo from Twilight Princess and he appears to be pointing Link in a direction and showing him a map, I think he will assume a larger role, perhaps similar to his role in Majora’s Mask. 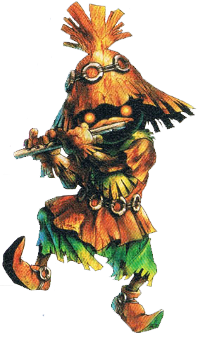 Then in the next Skull Kid scene, he ‘talks’ to the Skyward Sword – in a way reminiscent of Midna’s speech, although I don’t think that means anything – and we finally get to see the feminine figure emerge from the sword. It’s surprising that it hadn’t appeared in either of the previous two trailers besides the image on the D-pad. This is the first time her actual character model has been shown. She looks a little more childish and more defined than she did in the concept art from two years ago, and a little more like the Fairy Queen from The Wind Waker. They don’t quite look exactly the same, but I’m willing to bet it’s just because of the graphics style. The Wind Waker was more of a cartoony game than Skyward Sword, so of course the Fairy Queen would look more cartoony in The Wind Waker. Skull Kid seems to know a bit about these equipment spirits since he’s able to summon one. Could this contribute to explaining how the design for the Gilded Sword reached Termina? Also notice that in the background you can see the door from the first scene of the GDC trailer, in which Link also has six hearts. Presumably Link enters this door next, leading to the first dungeon. At the end of the dungeon, we actually see Link fighting the scorpion from the first trailer. The arena is different, but the symbols that link it to the first dungeon remain. I suppose that supports Nintendo’s statements about the area from the first trailer not showing us a real, complete part of the game. Since the scorpion has vulnerable eyes and appears in a dungeon with Skulltulas, it’s reasonable to assume that this is Gohma, meaning the recurring boss will once again be the first boss of the game like she was in Ocarina of Time and The Wind Waker. Link is then seen running off the same cliff that he met Sheik on, except this time we see him landing on one of the clouds. So this must be what Aonuma was talking about when he said Link would not be flying through the air like Pit. I didn’t notice anything of importance in the rest of the epic gameplay scenes fighting enemies in the clouds and on the airship, although they were amazing. The last several shots – probably of the land below – are very quick, but if you’re attentive you’ll notice several defining things about some of these scenes. For example, one scene obviously resembles the entrance to the Shadow Temple. You can expect another analysis of all these symbols with screeshots and comparisons to the other trailers and other games in the forum. This is definitely the most impressive trailer yet, and the theatrical style is very nice. We finally get to see major plot details and get an idea of how this game is going to open, and its great to finally get that. There seems to be an unexpected amount of dark scenes in this game, as well as technology. Still, the art style remains intact and the origin of the Royal Family should be interesting to see. If you haven’t seen the trailer yet, you should check it out.